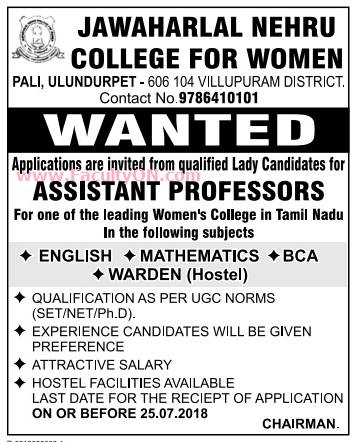 Jawaharlal Nehru College for Women, Villupuram has advertised in the DINAMALAR for recruitment of Teaching Faculty- Assistant Professor / Warden jobs vacancies. Interested and eligible job aspirants are requested to apply on or before 25th July 2018. Check out further more details below. How to Apply: Interested and eligible candidates are requested to send their letter of interest and detailed resume both soft copy and hard copy addressed to the Managing Director of the college. Villupuram District – 606 104.